August was a busy month here in Trojes. We were inundated with visitors from all over! Mid-August, a group from Maine came to conduct a study on a few of our filters. They are very interested in the efficiency of a new technology Pure Water began using a few years ago. 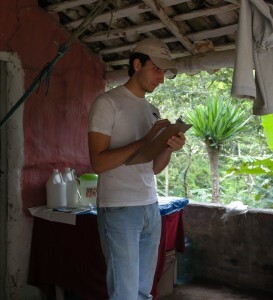 The group consisted of two scientists, two translators, a previous visitor, and several high school students. It was great to get to talk to them and hear about their passion for water. They are able to use their scientific skills to make sure the people of Honduras are receiving the best quality water possible. Their study is to be independent from Pure Water and they hope to be able to publish their results. So, because it was independent, we couldn’t help at all. Rony is getting really good with his English, so he served as a familiar face to the families and driver for the group. I went with them one day to see the full process and get some pictures. They wouldn’t even let me put the samples in the cooler! And sadly, it started pouring down rain, so I didn’t even get as many pictures as I wanted. Towards the end of August, we were greeted by Maria, Oscar, and two representatives from our filter technical advisor, CAWST. Eva is from Spain and David is from the UK, but they both live and work from Calgary, Canada. Eva and David travel for 4-8 weeks at a time up to 6 times a year. Their projects are all over the world: Laos, Nepal, Zambia, Ethiopia, Cambodia, and now with Pure Water in Honduras and Haiti. Like I said, we’ve had a cultural few weeks. Three days were spent in all day classes learning about CAWST and a new program that Pure Water has been selected for, the WET Centre (Water Education Training Center). It is a big honor to be chosen for this project. Pure Water will be hosting classes for other NGO’s that wish to use Biosand filters and will be CAWST’s representative for all of Central and South America! This basically means that our technical advisors think we do our jobs so well they are willing to name us as the official training center for over 15 countries. Our team does an amazing job and I am so proud! The 4th day of their visit, the group went to a couple of communities to give hygiene talks. Friday we spent the day inspecting sand and installing a few Biosand filters in a local home. We are looking at switching to a new quarry that is closer to Trojes, so we thought we could use the advice of the experts while they were in town. Saturday Michael, Mario, Eva, Arlen, Oscar, and David worked with the sand from the new quarry. 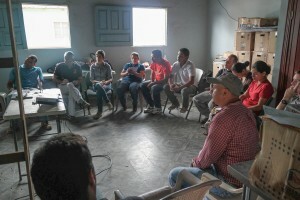 Finally, the team traveled to a town outside of Tegucigalpa to give the first WET Centre training to about 5 different NGO’s. I’m excited to see how everything goes. I’m sure they will do great! Stay tuned for an update on that workshop!